The incubus has been used as a recurrent motif in arts practice, often as a distorted reflection of our political and cultural realities. 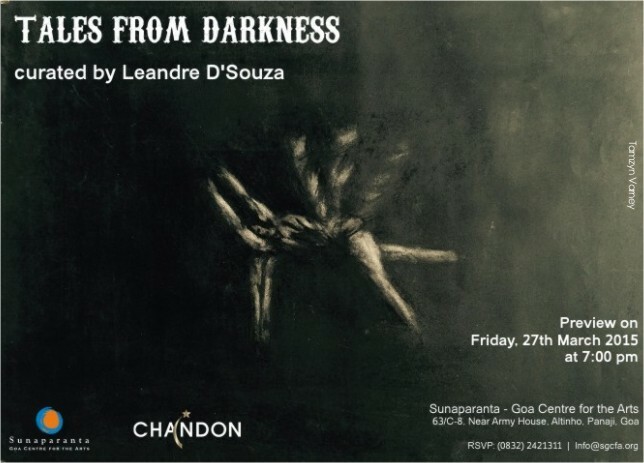 Tales from Darkness is a chamber of wonders revealing different faces of the horrific – individual fears, collective anxieties, universal horrors. It becomes a visual jumble opening our minds to a delirious territory, infested with haunted and grotesque presences, anxious doodles, and carnal abjections. Part of a traveling exhibition brought to Goa by Berlin-based artists Marcus Sendlinger & Caro Suerkemper, it includes works on paper, sculptures and site-specific installations by artists from Germany, South Africa, UK, Slovenia, US and India. Since 2010, Sendlinger has been inviting artists to produce one work related to the subject of Alptraum – nightmare. In every destination, new works are added by local artists. The project signals a new form of art-making, one whose boundaries are constantly stretched and whose content remains in a state of perpetual flux. By insinuating this sense of uncontrolled wandering into the innermost recesses of the human mind, the works lure the viewer into an eerie, threatening yet seductive imagery. It lays bare a private realm, a zone where one’s most secret thoughts, beliefs, fantasies, fears disclose without barriers. It is a space of resistance, where the sinister, the irrational and the sensual collide and erupt with disturbing ease. This exhibition is organized by Sunaparanta – Goa Center for the Arts and opens from 27th March till 30th April 2015.